Set up your barbecue for direct cooking with a half hotplate or Weber Q Ware Frying Pan on barbecue. Please refer to your handbook for further instructions. Preheat your barbecue for barbecuing. Once the barbecue has preheated, adjust the burner control(s) to medium. Place the bacon on the on the grill and cook for 3 minutes per side or until crispy. Once cooked, remove and place on paper towel. Add a little olive oil to the hotplate or frying pan. Crack the eggs onto the hotplate or in the frying pan, season with salt and pepper. Place the brioche rolls, cut side down onto the grill and cook for two minutes. Remove the brioche rolls and the eggs once they are cooked to your liking. 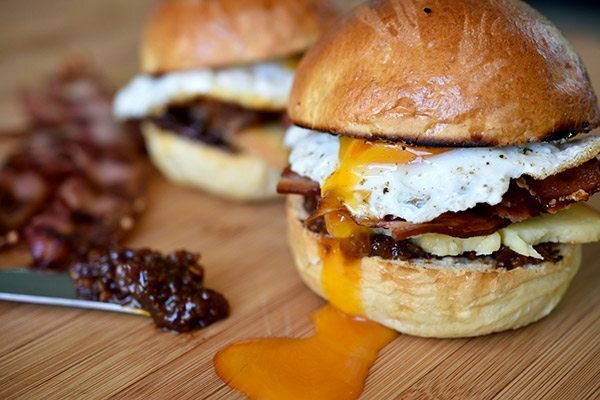 Assemble the breakfast burgers with the bacon jam, smoked cheddar, crispy bacon and finish with an egg.